When it comes to traveling on the world's airlines, most passengers find the experience to be extremely frustrating. Those frustrations are caused by a cumbersome reservation process, high ticket costs, excess fees, long lines for security and the potential of missing connections or not arriving at the flight's destination, for a variety of reasons. For people who are paralyzed, or who use mobility devices due to other causes, there is a different "F" word that goes far beyond Frustrations when we fly: that word is FORGOTTEN, whether completely or as it affects our valuable, and vital, assistive devices. That may seem inconceivable to many frequent fliers, but it happens on a regular basis to those who decide to take on the risk of venturing into the "un-friendly skies" because they need to travel long distances and don't have other options for doing so. Christina Mills, from Benicia, CA, went through an ordeal caused by such forgetfulness when a flight home from vacation with her family required a change of planes in Las Vegas. Mills, who uses a manual wheelchair due to Osteogenesis Imperfecta, travels with two adapted car seats that allow her and her husband to push and pull their two young children through airports and elsewhere on the trip. After arriving at their destination, Oakland, she learned that her wheelchair was not on the plane and no one at the airline seemed to know where it might be located. Besides being stranded in the airport while seated in a giant wheelchair that she could not push, the wheels were missing from the children's car seats. Worse yet, the airline's required Complaint Resolution Officer was not on duty at the airport and the other staff she spoke to seemed to shrug off the situation and treat the situation like just another case of lost luggage. Thankfully the wheelchair finally arrived, four hours later, but the assistive technology for the car seats could not be found. The airline finally sent an apology, via Twitter, that apologized for the "inconvenience" and offered a travel voucher for a future flight. Mills has started the complaint process with the Department of Transportation over what she believes are violations of theAir Carrier Access Act and will also be writing to the CEO of the air carrier and several media outlets about the treatment she and her family received. As someone who uses a power wheelchair due to paralysis caused by a spinal cord injury, there have also been several incidents related to forgetfulness that definitely detracted from the enjoyment of my travel experiences. One of the most egregious happened at the end of a flight from Washington, DC to Sacramento. After waiting on the plane for about 45 minutes after the rest of my fellow passengers had disembarked, the gate agent finally came to my seat and said that there was "a problem." 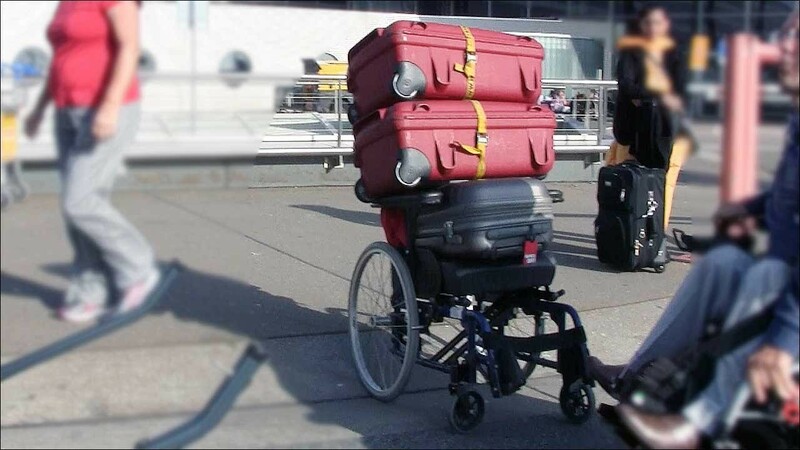 The problem turned out to be that one of their employees at the origin had forgotten to load my wheelchair into the cargo hold before the plane departed. Their next flight from Washington to Sacramento was not until the next day. It was already late in the evening, so businesses had closed and thus nothing was available to rent or borrow from any wheelchair-related vendors in Sacramento. What should have been a six-hour trip ended up taking the better part of two full days before I was finally seated in my wheelchair at home, "no thanks" to that forgetful employee. Even then, I had to take a Super Shuttle van back to the airport parking lot the next afternoon in order to retrieve my personal wheelchair van that can only be driven by me while seated in my wheelchair. When it comes to being forgotten while flying, Chad Colley of Daytona Beach, FL had an experience that no one should endure. Colley is a disabled veteran, a triple amputee as a result of an explosion in Vietnam, and a frequent flyer on trips throughout the world. One of those flights, from Geneva to Chicago, arrived late at night. He was traveling with his wife and the couple was seated near the back of the plane, since his smaller size made it easy to get transferred and seat them there instead of requiring seats near the front door. His manual wheelchair traveled in the cargo hold. After almost an hour after the arrival all other passengers had left, and it became obvious that this was not going to be a normal departure from the plane. Lights were shut off in the cabin of the jumbo jet, and no one was left on the plane except the Colleys. What followed was quite an adventure, as he had to crawl to the front of the plane, where they found a flashlight that was available for flight attendant use in case of an emergency. Their next challenge was learning how to open the door on a DC-10 from the inside, with no other help. They were finally able to crack the door open enough that they could shine a flashlight out of the gap in the doorway, where they found that airline employees had already pulled the jetway back from the plane; they were faced with about 10 feet of open space. The flashlight finally got the attention of a passing Jeep driver towing luggage carts and he alerted Airport Security, after first advising the Colleys that they should not be on the plane. What ensued was worthy of a Keystone Cops movie, but in another hour they were finally off the plane and on their way to their hotel. The airline never did explain who was responsible for leaving the Colleys on the plane, nor if any disciplinary action was taken. Not every incident involves items or people being forgotten. The vast majority involve damage to valuable mobility equipment that often renders it unusable and requiring replacement. The Internet is full of stories from people complaining about damage or discrimination against travelers with disabilities each month. How bad is this problem? It is serious enough that the Department of Transportation makes an annual report to Congress about the status of all complaints lodged against domestic and foreign carriers operating to, from or within the United States. The latest report available, covering 2014, shows 27,556 complaints were forwarded to DOT by individuals and by the carriers who received them. Large domestic carriers were the object of the most complaints, probably due to the fact that they haul the most passengers. Since many passengers with disabilities who encounter problems do not take the time to file a complaint, it is likely that this number is seriously under-reported. It is also unclear how many air carriers fail to voluntarily submit their summary of complaints to DOT each year. Advocates with an organization called All Wheels Up are working to get the Federal Aviation Administration to allow, and hopefully require, air carriers to allow wheelchair users to stay seated in their chairs while flying if they choose to do so. Since wheelchairs have been safely secured for travel on all types of transit vehicles for several decades, this seems like a logical next step. It is hoped that the entire disability community will get behind this movement and write their elected representatives to explain why it is so important. When that happens, perhaps we will no longer be putting our valuable mobility devices at risk every time we fly, nor will we continue to be flying as "the forgotten ones."